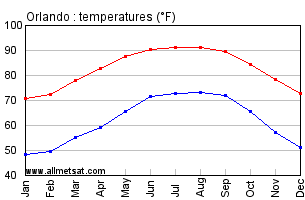 Central Florida summers (June through September) are tropical - hot and steamy with occasional afternoon thunderstorms. Our fall and spring weather is spectacular, and our winters are warm, bright and sunny with little to no humidity! Perfect for a visit! The coolest average high for the year is in the middle of January, when the mercury still hits 70 degrees Fahrenheit (21 degrees Celsius). Winter evenings can be cool and a light jacket is recommended. 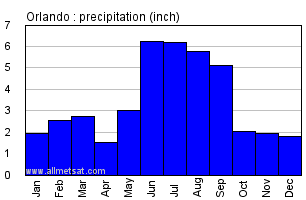 Below are charts for Orlando average highs and lows and average rainfall. Plan accordingly! Below is a snapshot of the current weather.